Creates an unstoppable mindset through hypnosis to attain abundance, wealth & financial circumstance. This CD will help you create and attract better financial circumstances by utilizing the laws of attraction and developing a strong mindset towards bringing forth abundance in all areas of your life. It help you develop more motivation and an strong drive to set your goals and achieve them in a realistic time-frame. It will assist you to become more positive and embrace the good things that come your way and is especially helpful if you are the type of person who adopts an "I don't deserve it" type mentality and turn it into "I Am and I Will". I used the Abundance CD and doubled my income after only 7 weeks. 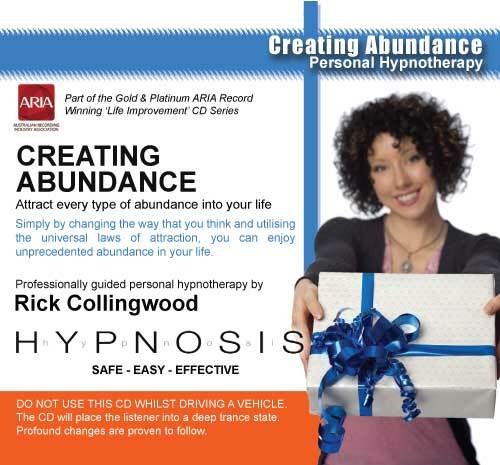 Before I used this CD I had tried all types of other abundance programs with no luck until now – Rick’s CDs really do work and I have since purchased other titles and they have all been life changing for me. The Intuition and Quit Smoking MP3s came through like a champ. Imagine... all the way from Australia to Florida. Wish I could travel down for a visit that quick! The Body Toning one isn't critical and will wait awhile longer to see if the CDs arrive maybe this week. Please pass along to Dr. Collingwood that myself and my husband are seeing AMAZING results with the motivational and younger you sessions. I will admit to some interesting dreams, which we are remembering quite easily, and then the miracles occur the next day with what we are accomplishing (projects that have lingered for years, exercise program I just couldn't get started before, new business plan in the works...) and our much improved positive attitudes. So grateful! We will continue to share your website with friends and family. I really enjoy the "Creating Abundance" CD. Really get a lot out of it. I play it 2 or 3 times a day. It really kicks in the 2nd time. I have recently been listening to your Abundance CD and have been enjoying it greatly. It is just about time for a new one (am thinking of going two, one in the morning, one at night) and wanted to ask a question. Thanks again for a quality product, Rick and I hope to hear from you soon. My husband and I are amazed with the results we have seen over the last 60 days by incorporating Rick’s CDs into our nightly routine. Prior to the Happiness and Self-Esteem CD, my husband was a bit of a recluse. He was very uncomfortable and reserved around strangers. Last weekend we were out together at our community pool area and he began introducing me to people he had met in the neighbourhood. I was shocked! I truly have seen a significant change in his ability to be outgoing, social and overall more confident since listening to this CD. a worry and scarcity mentality, to one of abundance. I'd like to say how much of a fan I am of your work!! Thank you so much for your CD's, they’re fantastic - I've used the Weight Loss and Abundance CDs so far and they've work for me! I've also got my friends copies of your CD’s and you are changing their lives too!